A one time date change is on tap for November’s Fiddlers Jam at Ely Stage Stop and Country Museum. While Jams are typically held the first Sunday of each month, a fundraiser activity in the barn the night before November’s first Sunday has resulted in a change to November 9 for the next Jam. The museum will be open as usual, but the Jam will push out to the second Sunday. Note this is only for the month of November. In December and going forward, the schedule will revert to the first Sunday. You can still come and enjoy the museum with all of its latest acquisitions and displays any Saturday and Sunday from 11 a.m. to 3 p.m. The stage stop, operated by the Lake County Historical Society, is located at 9921 Soda Bay Road (Hwy 281) in Kelseyville. Learn more about the Saturday, November 1st fundraiser to benefit the museum’s new blacksmith shop at www.elystagestop.com or www.lakecountyhistory.org, check out the stage stop on Facebook at www.facebook.com/elystagestop, or call the museum at 707-533-9990. Ever wonder what was served by the best bars in the Old West? Taste the past, savor the present at the Ely Stage Stop on Saturday, November 1st, from 05:30 p.m. to 08:30 p.m., when docents host their next fundraiser event. Join them to learn about and to sample the libations and tidbits enjoyed in the grand bars of the Victorian-Era West. Cocktails will feature recipes from the famous “Professor” Jerry Thomas, considered “the father of American mixology.” Thomas authored the first “drink book” ever published in the United States. Finished in 1862, the book collected and codified what was then an oral tradition of recipes from the early days of cocktails, including some of his own creations. 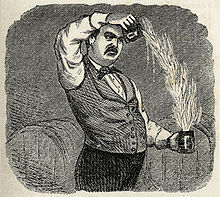 The book laid down the principles for formulating mixed drinks of all categories and established the image of the bartender as a creative professional; hence his nickname “the professor.” Thomas bartended on both coasts and worked at the Occidental Hotel in downtown San Francisco during the Gold Rush years. Perfectly paired small plates inspired by the grand Victorian Era bar cuisine of San Francisco will be presented by Rosey Cooks, Lake County gourmet caterer. Come learn, sip and taste some history. Proceeds of this Ely fundraiser will support the museum’s new blacksmith shop. Tickets are $75 per person and include cocktail tasting and small plates with some additional surprises. Guests must purchase in advance by Sunday, October 25th as seating is limited. Guests must be 21 years of age to participate. Please drink responsibly. Call 707-279-0493 for your tasting ticket. Support the Ely Stage Stop and Country Museum, Home of the Lake County Historical Society, preserving Lake County’s past, present and future. Visit www.elystagestop.com or www.lakecountyhistory.org or check out the stage stop on Facebook at www.facebook.com/elystagestop.